Please see our previous post here about how this all breaks down. This video is put out by our friends over at Oregon Transformation. 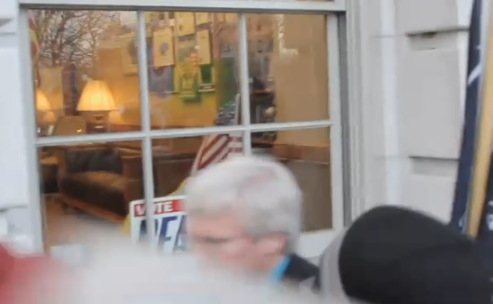 GOP Lawmaker Mobbed by Protesters in Wisconsin! "Don’t Hurt Him!" Protesters have to be told not to hurt him. “Don’t touch him!” one protester begs to the others. State Senator Glenn Grothman is mobbed and pushed along with the crowd. It takes another State Senator–a democrat who’s been protesting– to save the elected official from the mob. Democrat Brett Hulsey then holds up his hand to create the peace sign and a lefty picks it up and begins lulling the others into a chant to placate them like you do with a rowdy roomful of school children. They’re despicable, ugly and gross and they have a right to protest. Now what we need to do is get them away from the funerals of our soldiers–far enough away–so they can grieve in peace without these disgusting opportunists there to using the funerals to sell their cult. I agree with the court on this as a rights issue. I don’t like their message but they have the right. **UPDATED But there’s plenty to wonder about regarding the narrow information the court used to arrive at its decision regarding whether the father of the fallen soldier, Al Snyder, was purposely being singled out by Westboro. The “epic” written by the Westboro folks online singling out Matthew and Al appeared after the funeral. This was not taken into consideration about Westboro’s singling out the Snyders in the original case so the Supremes couldn’t deal with it here. Alito profoundly disagreed says the case should have been remanded to sort through those issues. This is a tort case of intentional infliction of emotional distress case. They found that the Westboro nuts didn’t do anything extraordinary to single out Al Snyder. They mentioned him but in the totality of their signs etc they believed it wasn’t an extraordinary display against him. Although his condescension towards citizens comes across crystal clear, he could use a little work on his sarcasm, which fell flat last evening at the council meeting. Bart, m’boy, I’ll tell you the same thing I said to Tonya Rulli. If you really wish to know about insults and intimidation, talk to a Vietnam Veteran and listen to what we heard, saw and had to deal with coming home from a war few understood in the late 1960’s and early 1970’s. If you re so bothered by hearing “follow the money” and “follow the power,” I doubt you could have handled coming back to America back then after experiencing the hell of Vietnam. I’ll leave you with one thought, Bart and something you really ought to consider. As you say to citizens, “think how you look on TV.” Imagine what you look like now with this juvenile little rant of yours. Work on the sarcasm, Bart, you haven’t quite honed it very well just yet. If you need help mastering sarcasm, call me, let’s do lunch.